Containing near contemporary and even, it would seem, first-hand accounts of the voyages of Columbus and other travellers, a 1512 autograph manuscript of the Dialogo… of Bernardo of Albenga was a star turn in a November 13 sale held by Sotheby’s (25/20/12.9% buyer’s premium). Notable among the accounts compiled by this Benedictine monk of Santa Maddelena at Monterosso, near Genoa, is the narrative of Michele de Cuneo, who is said to have been a childhood friend of Columbus and, as a gentleman volunteer, to have joined his second voyage to the New World. There he took part in the first exploration of the interior of Hispaniola (the island now divided between Haiti and the Dominican Republic) and sailed with Columbus on the expeditions that led to the first European landings in Cuba and Jamaica. On his return to Europe in 1495, Cuneo had given an account of the expedition to a fellow citizen of Genoa, which is now preserved in the University of Bologna. Although in more abbreviated form, the Bernardo manuscript does contain information not found elsewhere. There is, for example, the suggestion that Columbus got the idea of sailing west to reach the Indies from his knowledge of Ptolemy’s Cosmographia, and it seems that that Bernardo may well have known or met Michele de Cuneo. The discussion of the voyages of Columbus are joined in an appendix by accounts of those to the Arabian Sea, the Gulf of Aden and the Red Sea, and of others to the coasts of Africa and on into the Indian Ocean, made by Alvise da Mosto, Alonso Nino, the Pinzon brothers, Vasco da Gama and Pedro Cabral. And on the final page is a note on Amerigo Vespucci’s voyage to Brazil and towards Antarctica. In many instances these brief accounts seem to have been supplied by either the explorers themselves, or their companions. 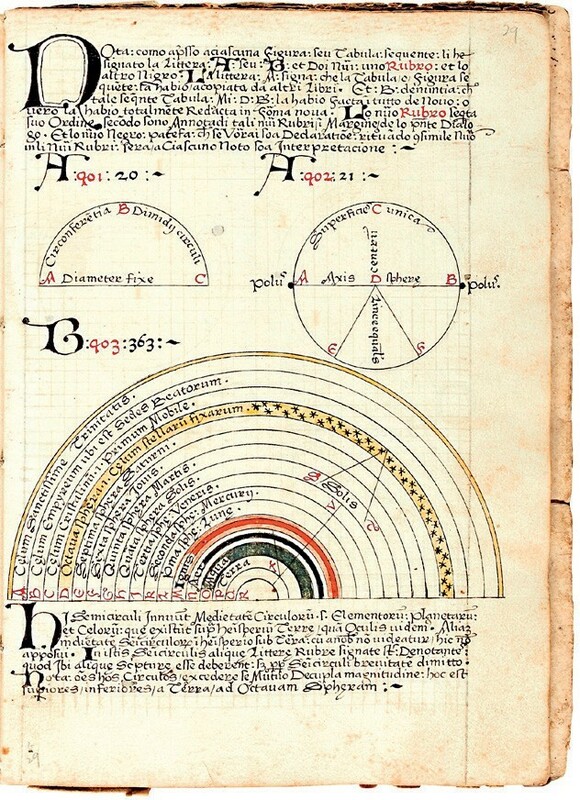 Running to some 49 leaves and still retaining its contemporary, vellum-backed stiff paper binding, this work is also remarkable for the compiler’s fascination with the instruments and navigational skills that made the voyages possible – and the manuscript contains 18 partly coloured astronomical diagrams. A former Honeyman manuscript which made £4000 in the late 1970s, when that vast scientific library was sold at Sotheby’s in London, it reached $120,000 (then £82,760) when sold at Christie’s New York in 2000, and this time realised £380,000. 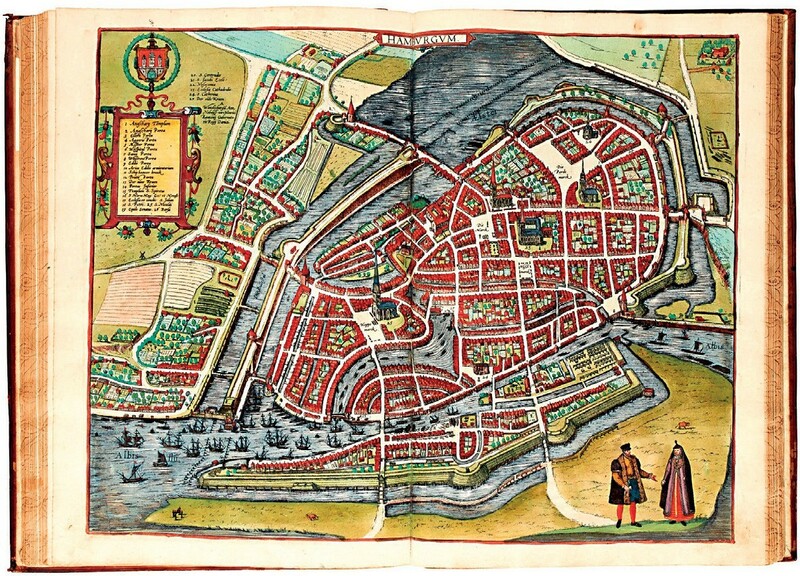 Reproduced is a double-page plan of Hamburg from a fine set of the first five (of six) volumes that would make up a Latin text edition of Braun & Hogenburg’s famous town books, the Civitatates orbis terrarum. In good contemporary German bindings of calf gilt, the five volumes of 1596-99 lacked four of what would have been a full complement of 304 double-page plates – among those missing being London and Rome – but all were fully coloured and this set sold for £210,000 at Sotheby’s. Known to have been part of the library of Engelbert von Auersperg in 1655, this set came to auction from the library of Count Batthyány. Somewhat surprisingly, perhaps, this great work was one of the best-sellers of the 16th century, and the Sotheby’s cataloguer notes that it is likely that sets were intended for the better educated, as there are far more editions in Latin than in German or French. In the latter the titles were printed on slips and pasted over the Latin ones. Other lots from this £2m sale will be featured in future issues.